I love Newegg, because while they are mostly known as an electronics bargain outlet, they also offer other random deals. For instance, today they are discounting top designer sunglasses at a minimum 80% OFF. The best part is every order comes with FREE shipping. Well, the 80% discount is pretty great too, now that I think about it. Selection is limited, to be sure. but where can you get Kenneth Cole, Converse, and Timberland sunnies at that price? Show me and I'll post it. So yesterday I left my sunglasses in my now ex-girlfriend's car, and don't think I'll be getting them back. Today Newegg is offering sick deals on designer sunglasses. Eerie? Maybe. Totally awesome. Probably. Anyway, those in the picture are what I got for $15 instead of $128. 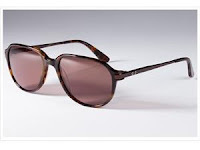 Click here to view the list of sunglasses on sale at Newegg.com.